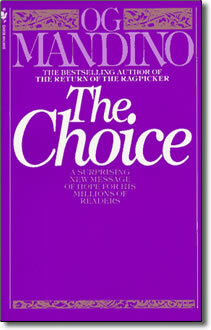 The Choice paperback by Og Mandino – Discount! Og Mandino’s most personal and powerful story explores what lies beyond the golden doors of success, fame, and wealth. He reveals for us the most precious commodity of all: the freedom of choice–the key to a freer, richer future whose secret element is love. Choice! The key is Choice. You have options. You need not spend your life wallowing in failure, ignorance, grief, poverty, shame, and self-pity. But, hold on! If this is true then why have so many among us apparently elected to live in that manner? Who would be fool enough to choose failure over success, ignorance over knowledge, poverty over wealth? No one! So, how do we explain that vast multitude of humanity that continues to exist in hopeless mediocrity? The answer is obvious. Those who live in unhappy failure have never exercised their options for a better way of life because they have never been aware that they had any Choices!